Turnarounds, shutdowns and outages (TSOs) are high-profile, complex and time sensitive projects. With millions of dollars on the line each day in lost production revenue and labor costs, it is imperative that the TSOs be completed on schedule. Typically, TSO field personnel keep notes of activity progress and report the progress to a scheduler. The scheduler then needs to enter that progress into Primavera. This process can be error-prone and consume large amounts of a skilled and expensive scheduling resource's time. That time could be much better spent analyzing the schedule, detecting issues, and developing mitigation strategies. TAPS uses barcode scanning technology to eliminate the need for lengthy manual data entry when updating your Oracle Primavera P6 schedules. Simply use a barcode scanner to find, start and update any activity within the schedule in two fast scans. With TAPS, time is no longer wasted searching for one activity among thousands in P6 and manually updating the start, finish and percent complete of each activity. 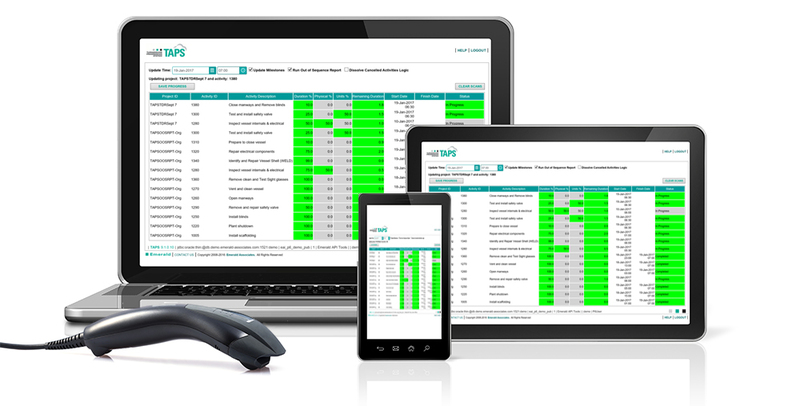 Emerald’s Turnaround Progressing System (TAPS) increases your accuracy and cuts your shift statusing time by 75%. Shift reports are delivered on time, allowing management to make informed decisions based on timely insight into the current health of the TSO. Less experienced, less expensive resources can take on the job of updating tasks, while experienced schedulers are freed to analyze and act on the latest data. As a result, issues are avoided or mitigated before ballooning in to larger more expensive problems and the TSO remains on schedule. “With virtually no training needed and a simple installation, TAPS is a cost effective way to boost my team’s productivity. We can easily update a large detailed schedule which allows us to gain valuable visibility into performance and issues in real-time. This frees up schedulers time to analyze and mitigate issues before they balloon into larger more expensive and time consuming problems, which can make the difference in getting back into production on schedule. This course will expand on the professional fundamental and advanced Primavera P6 training courses (102&102A) to teach you how to extract the most value from Primavera P6 for managing Turnarounds, Shutdowns and Outages. This course provides hands-on training for Primavera’s client/server based solution. This course is a prerequisite for our T100 specialized course and the Advanced P6 training course. Attendees need to understand the basics before they can leverage the software for highly specialized projects. This two-day course provides in-depth project management training in Oracle Primavera’s client/server-based solution.